NASA’s Phoenix spacecraft ha s discovered evidence of past water at its Martian landing site and spotted falling snow for the first time, scientists reported Monday. With summer waning, less sunlight is reaching the spacecraft’s solar panels on Mars. “It’s really kind of all up in the air,” said William Boynton, a mission scientist at the University of Arizona at Tucson. A laser aboard the Phoenix recently detected snow falling from clouds more than two miles above its home in the northern arctic plains. The snow disappeared before reaching the ground. 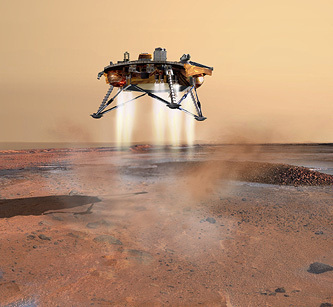 hoenix landed in the Martian arctic plains in May on a three-month mission to study whether the environment could be friendly to microbial life. One of its biggest discoveries so far is confirming the presence of ice on the planet. NASA extended the three-month mission through the end of the year if Phoenix can survive that long. With summer waning, less sunlight is reaching the spacecraft’s solar panels.